The MSA-0011[Ext] Ex-S Gundam (aka Extraordinary-Superior Gundam) is an upgraded version of the MSA-0011 S Gundam that appears in Gundam Sentinel. The mobile suit is piloted by Ryu Roots. By adding several new armor, weapons, and engine modules the engineers of Taskforce Alpha's Pegasus III were able to upgrade the basic MSA-0011 S Gundam into the super powerful Ex-S Gundam. The Ex-S Gundam has almost double the power of the original S Gundam, making it a fearsome unit indeed. The Ex-S Gundam still had three cockpits, but Ryu Roots was the only person who piloted the mobile suit, and due to Ryu's poor piloting skills it was up to ALICE, the Ex-S Gundam's highly advanced artificial intelligence combat computer, to do most of the fighting against more skilled opponents. With ALICE functioning as the co-pilot of the Ex-S Gundam "she" was constantly getting more advanced. ALICE was constantly growing in comprehension and depth, and was swiftly evolving into something more akin to a fully rationalizing and thinking creature than a simple machine. ALICE could still take full control of the Ex-S Gundam, or any of its various components or weapons, at any time, and would begin to do so constantly at times when "she" felt the Ex-S or Ryu were threatened. ALICE proved to be a useful co-pilot of the Ex-S Gundam, and "she" was more than capable of compensating for Ryu's lack of skill. 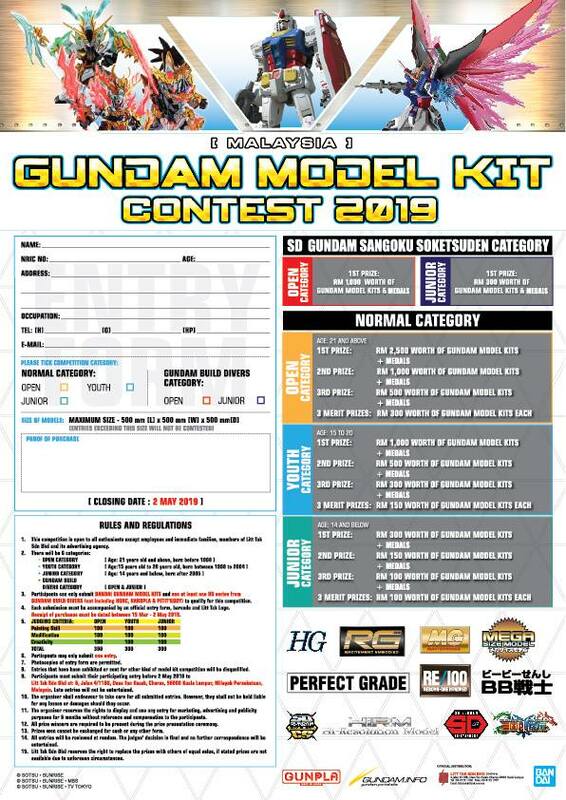 For defensive purposes the Ex-S Gundam featured additional armor on the front of the chest which afforded extra protection for the first two cockpits. This extra chest armor also featured an I-Field generator which created an invisible barrier of Minovsky Particles around the Ex-S Gundam's cockpit block which could nullify ranged beam attacks made against the mobile suit. Additional armor added onto the front of the torso also protected the third cockpit, while extra armor on both sides of the legs featured more after burners, additional propellant tanks, and thrusters. Two new large thruster units were mounted on the Ex-S Gundam's back, giving the unit incredible thrust power and speed. Two large caliber beam cannons were mounted on both of the thruster units, giving the Ex-S Gundam two more back beam cannons than the S Gundam. 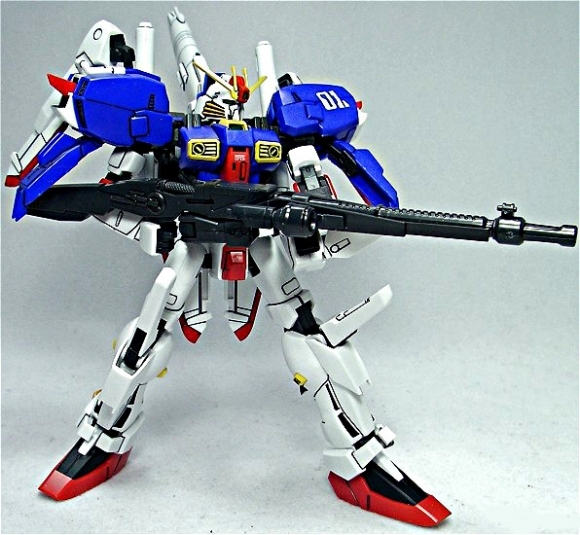 The Ex-S Gundam's beam smart rifle was now attached to the front torso of the mobile suit instead of the hips, making room for the two large hip beam cannons that were optional on the S Gundam to be attached to the sides of the Ex-S Gundam's waist permanently. 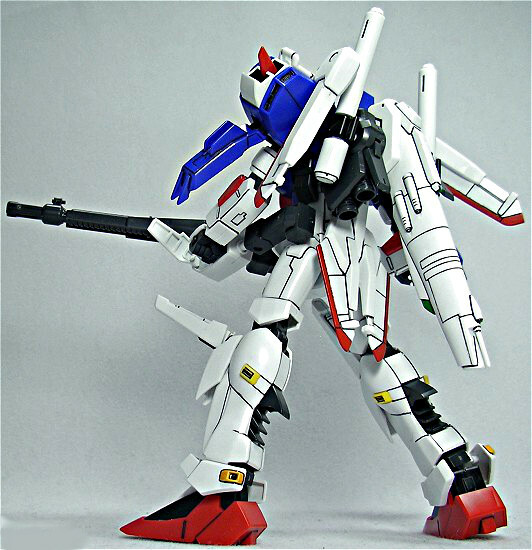 The Ex-S Gundam's head featured four 60mm vulcan guns, while four additional 60mm vulcans were mounted on the tail stabilizer attached to the back. The Ex-S Gundam also had remote weaponry in the form of an incom, which was a small wire-guided red disc stored in the Ex-S Gundam's forehead that could fire beams when deployed. But the Ex-S Gundam also featured two reflector INCOMs, stored in brackets in the large knee armor, which could be deployed and guided by wire like a standard INCOM. Reflector INCOMs could not fire their own beams but instead were able to reflect incoming beam fire from the Ex-S Gundam or another unit, and redirect it in another direction. Lastly, for use in melee combat situations, the Ex-S Gundam featured two beam sabers, also stored in the knee armor. Like its predecessor, the Ex-S Gundam was also capable of undergoing a transformation into a waverider mode of sorts, but unlike the S Gundam, which divided into three separate components, the Ex-S Gundam re-combined into one large unit called the G-Cruiser. For its size, the G-Cruiser was incredibly fast and the Ex-S Gundam would travel in this mode whenever it needed to travel over a great distance in a short amount of time. To conserve the fuel of the Ex-S Gundam for use in actual combat situations the G-Cruiser had two large propellant tanks mounted in the front over the Ex-S Gundam's shoulders. These extra fuel tanks would be jettisoned when the G-Cruiser would reach the battlefield and transform into the Ex-S Gundam.